Godfather of Taiwan independence Lee Teng-hui has just sent shock waves through the Taiwan independence movement. In an interview with Taiwan’s Next magazine, Lee apparently recanted his position on Taiwan independence, leaving Taiwan independence True Believers in shocked disbelief. Lee’s apparent recantation raises two questions. The first question is hard to answer. Fortunately it’s the less important of the two questions. Whether Lee actually means what he says is of greater concern to Taiwan independence True Believers, who are still picking their jaws off the floor. The second question is actually the more important of the two questions, and fortunately it is easier to answer. It is difficult to see how Lee’s recantation could possibly benefit the Taiwan independence movement, regardless of what Lee might have in mind. Lee’s recantation on January 31, 2007 is effectively a sequel to Deep Green industrial magnate Hsu Wen-long’s recantation on March 25, 2005, and constitutes the second blow of its kind to the Taiwan independence movement in two years. 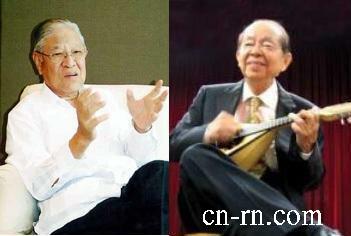 Lee is reported to have met secretly with Hsu Wen-long recently. Lee may well have been discussing his imminent recantation with Hsu during their meetings. Is Lee attempting to use the imminent dissolution of the DPP, with its 18% or less public approval rating, to create a more viable “Third Force” that could achieve Taiwan independence later on? Very possibly. Is Lee attempting to spare himself eventual prosecution and imprisonment for massive corruption by ingratiating himself with KMT Chairman and 2008 presidential front runner Ma Ying-jeou? Very possibly. Is the 84 year old Lee merely attempting to provide himself with a legacy besides “Godfather of the Taiwan independence movement” — the abortive, stillborn, failed, Taiwan independence movement.? Very possibly. But even assuming Lee has a hidden agenda, patriotic Chinese on both Taiwan and the Chinese mainland can get a lot of mileage out of Lee’s apparent recantation. They can make plenty of hay out of what Lee said, using it to promote eventual peaceful reunification. In short, it’s not necessary to believe that Lee is sincere. It’s enough that he has paid lip service to forsaking Taiwan independence. 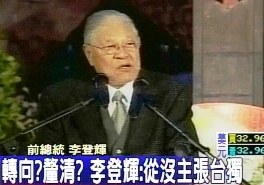 Former president Lee Teng-hui, the so-called godfather of [the] Taiwan independence movement, said he no longer hates [mainland] China and even wants to visit [mainland] China. In an interview with NEXT weekly magazine Wednesday, Lee, 84, said he has received many invitations and would like to visit [mainland] China. ‘If I can make the trip, I would like to visit all the places which were visited by Confucius,’ Lee said. 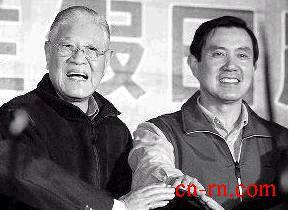 Lee was Taiwan’s president [correction: the Republic of China’s president] from 1988 to 2000. He was the first Taiwanese to become the president of Taiwan [correction: the Republic of China], which was ruled mainly by Chiang Kai-shek and his son Chiang Ching-kuo – who fled to [the Chinese island of] Taiwan after losing the Chinese civil war in 1949. Lee abandoned the Chiang government’s goal of recovering the mainland and advocated Taiwan independence, triggering sharp reaction from China. Beijing blasted him for attempting to split Taiwan from China and fired missiles in Taiwan waters in late 1995 and early 1996 to warn Lee. [Mainland] China reacted cautiously to the statements from its erstwhile antagonist. ‘We have noticed the news report. We will cautiously monitor (Lee’s words and action),’ said Yang Yi, spokesman for [mainland] China’s State Council’s Taiwan Affairs Office. Caption: Lee Teng-hui forsakes Taiwan independence, hopes to visit mainland! Praises Ma, denounces Chen! Do you approve? A left of center TSU? What’s he up to? Any votes to be had? Caption: Drawing a line between himself and Taiwan independence? Have Lee’s demands for a new constitution and official name change vanished? Deep Green panelists on the Deep Green oriented talk show “Da Hua Xin Wen” were not amused by Godfather of Taiwan independence Lee Teng-hui’s latest bombshell, suggesting that he had turned his back on The Cause. Just look at the pained expressions on their faces!